Much like your favorite pair of jeans, a trusty denim jacket goes with just about everything in your closet. The neutral shade, casual vibe and timeless style means your look is never out of season—especially in cooler weather. The key to effortless cool is knowing when and where to pair your denim jacket, and we’re here to help. In general, your closet’s fall bottoms selection includes jeans, chinos, maybe joggers, and probably dress pants. You can wear a denim jacket with the first three. If you’re wearing it with denim, be sure to choose a wash that’s either lighter or darker or a completely different color (like black or grey or even olive or burgundy) than your jeans so your look is an on-trend denim-on-denim pairing, not a Canadian tuxedo mishap. Stylist Tip: Feel free to experiment with different designs. You might find you prefer edgy, distressed styles or that you gravitate towards a versatile, clean finish. 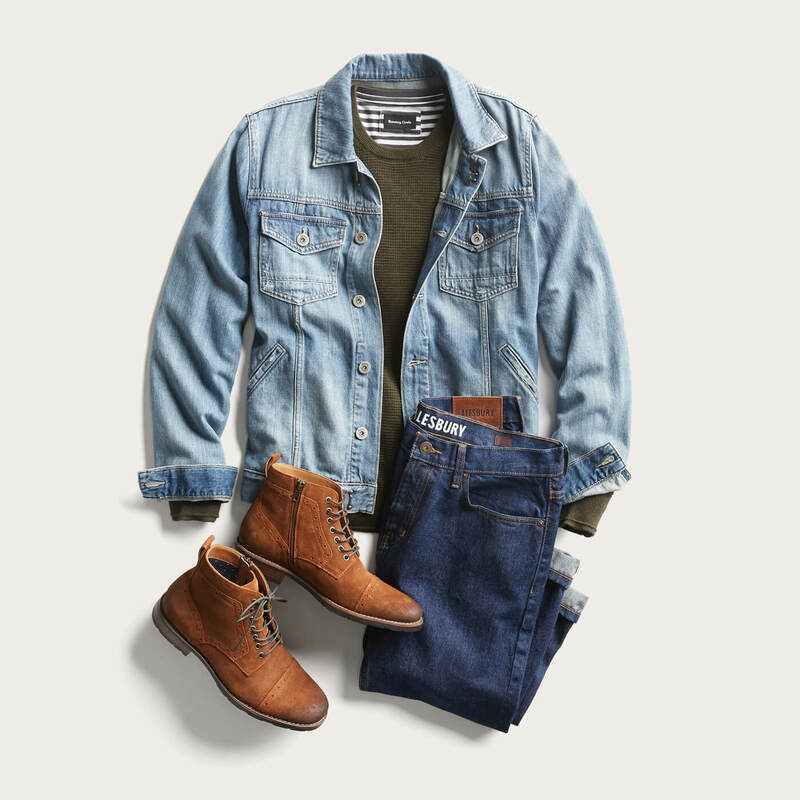 As long as you are wearing the right bottoms (see above), you can layer a denim jacket over any shirt in your closet: t-shirts, polos, flannels, button-ups, performance shirts, and even sweaters (you score extra style points with a hood you can pull out over the collar of your jacket). You can wear them over any color, any print, and any texture. They’re that versatile. The same rules apply to your shoes as they do to your bottoms: you can wear them with all your casual styles. Denim jackets pair well with sandals, sneakers, loafers, Chukkas, Chelseas and even brogues, but avoid wearing them with your Oxfords or dress shoes. Stylist Tip: For even more wearing power, look for a jean jacket with stretch in the fabric. This ensures a more comfortable fit through the chest and shoulders and a broader range of motion for your arms. Need help finding clothes to match your jacket? Schedule a Fix and get them sent right to your door.